Home Buying Guides Is there any assembly required for the Barbie Pop-Up Camper? Is there any assembly required for the Barbie Pop-Up Camper? Yes you have to put this together. The actual physical product being put together is a very difficult and just takes a little bit of time, but the most time-consuming and difficult part of the assembly is putting on the stickers which take forever and just finding were all the little tiny pieces should go so that the camper is set up properly for your little ones to play with. On a scale of 1 to 10 in terms of difficulty of putting it together it’s may be a two or three, but in terms of patients required to do it properly and have it look really good on a scale of 1 to 10 it’s about an eight! 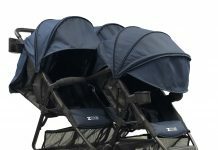 Top 10 Best Triple Strollers & Wagons for Triplets 2019! Top 10 Best Baby Walkers of 2019: The Definitive Buying Guide!